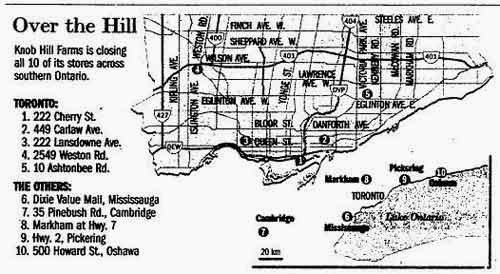 From November 2011 through July 2012 I wrote the "Past Pieces of Toronto" column for OpenFile, which explored elements of the city which no longer exist. I've republished all but two of those pieces on this website. Here's the first of the final pair, both of which provided good lessons for future writing. Prepare yourself for a lengthy preamble. In the case of this installment about Knob Hill Farms, I may have let youthful impressions of how dumpy their stores were overwhelm the chain's greater roles as a pioneering purveyor of ethnic groceries (symbolizing the increasingly multicultural makeup of the GTA) and an affordable food source for low-income families. "We serve the working man with a big family and not much to spend on food," KHF founder Steve Stavro once noted. "That's the market that has been totally ignored by the big supermarkets." Steve Stavro enticing shoppers to come to Knob Hill Farms at Dixie Plaza (now Dixie Mall). Source: the Globe and Mail, October 16, 1978. Click on image for larger version. Several readers offered well-considered points about KHF's strengths and the markets it served that conventional grocers like Dominion and Loblaws downplayed or ignored. It was the sort of constructive criticism that enlightens, rather than the roar of cranks commenting for the sake of being cranks. So what was my personal experience with KHF? My family usually stopped there during childhood visits to Toronto, either at the location in the Port Lands (now the Cherry Street branch of T&T) or, if we were driving back from visiting relatives near Port Perry, the Highway 7 and Woodbine store (now Michael-Angelo's). I long assumed we picked up groceries for my grandmother, but when I told my mother about the reaction to this article, she noted that my father liked looking at the unusual-for-the-time products they carried. This makes sense, as Dad's food curiosity genes carried over to me, and I can't resist finding hidden gems within supermarkets. Mainly, I remember the odd shopping carts, and large pools of water on the floor. As an adult, I occasionally drove to their monster-sized location in Cambridge (now the Home Depot on Hespeler Road, just south of Highway 401) during the last year I lived in Guelph, shortly before the chain closed. These trips were exercises in awe: how large the store was, how dark it was, how closely it resembled an industrial warehouse, and how time-warped it was. I tended to buy one item: Heinz vegetable beef soup. I swear it was the last supermarket in Canada to carry the stuff. The store was rarely busy whenever I wandered in, one of those places where you could fire a cannon and fail to hit anybody. The combination of dim lighting and aisles devoid of humanity created a post-apocalyptic air. Had the chain lingered on, the Cambridge terminal would have made a great zombie movie set. Here's the article as it originally appeared when it was posted on June 17, 2012. New images have been added. Advertisement, the Toronto Star, December 10, 1963. There were reasons Knob Hill Farms stores had the industrial-sounding tag “food terminal.” The décor suggested that a forklift had taken product from the receiving bay and dropped it on the sales floor. Warehouse-style shelving lined the aisles, whose floors showed little sign of a visit from Mr. Clean. Shopping carts designed to hold large baskets, cartons and cases had a romantic yearning for human shins (yours or another shopper’s). Several locations enjoyed previous lives as plants or warehouses. But for all its quirks, Knob Hill Farms was a trailblazer in the economy grocery sector. It proved people would trade frills for a lower food bill. Steve Stavro grew up in the food business—his father operated a store on Queen Street East near Coxwell Avenue. Around 1950, the senior Stavro helped his son open a fruit store across the street. Its name, "Knob Hill Farms”, reputedly derived from a carton of carrots he noticed on a trip to San Francisco—he later stated the name represented “class and top quality for the working consumer.” In 1954 he opened a proper supermarket on Danforth Avenue near Logan Avenue. As the business grew into a small chain, Stavro found he hated dealing with middlemen and the costs they added. His solution was the food terminal, a massive store with low overhead. 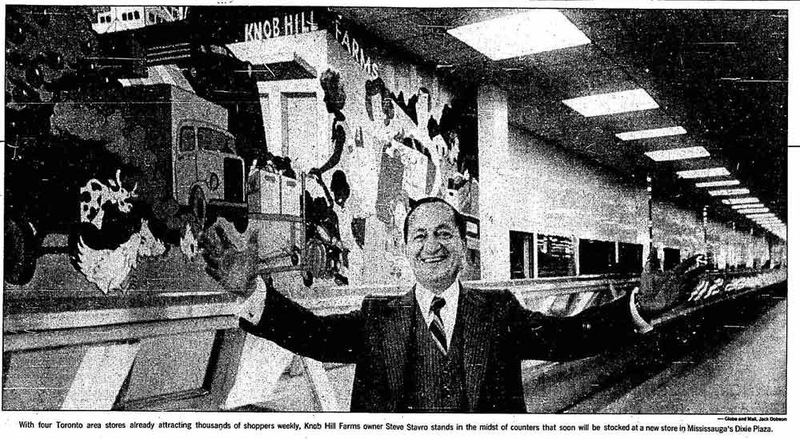 After selling his existing locations to employees, he relaunched Knob Hill Farms at Woodbine Avenue and Highway 7 in 1963. To stock the terminal, he dealt directly with producers, mostly from Ontario. Frills such as fancy shelving, bright lighting and shimmering floors were eliminated, as was prepackaging meat and produce in cellophane. It’s not a stretch to say that these cost-cutting measures would now be hailed as enviro-friendly and suit locavores just fine. For his skill at attracting customers and keeping prices low, one competitor dubbed Stavro the "Honest Ed of the food business." Advertisement, the Globe and Mail, February 5, 1976. As the company grew during the 1970s, bargain hunters accepted odd merchandising techniques like grouping products by brand instead of item. Staying open until midnight helped sales. So did stocking products catering to the GTA’s multicultural population in an age when most grocery stores still carried a traditional selection of food. 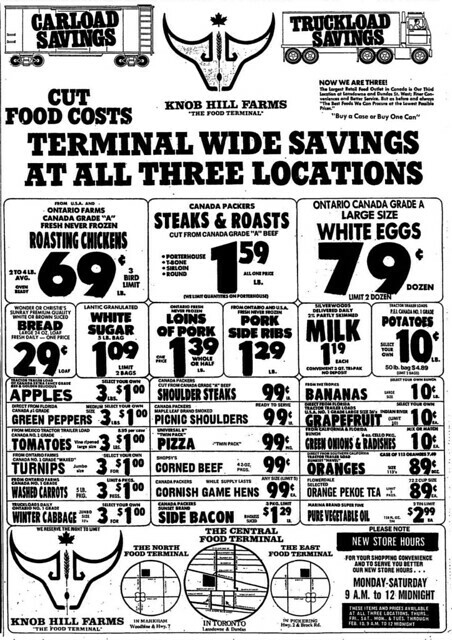 When the Dundas and Lansdowne store (presently No Frills) opened in 1975, customers could watch trucks unload fresh food in the middle of the produce department. As Stavro told the Globe and Mail, “I don’t like to do things behind closed doors. I want the customers to see everything and feel part of it. If you’re selling proper merchandise, you should have nothing to hide.” Like a certain Toronto mayor, Stavro claimed his “newswire” was talking to people in doughnut shops. Where Knob Hill Farms splurged was advertising (even if their television ads looked cheap) and store size. By 1991, the chain operated two stores (Weston/401 and Hespeler/401 in Cambridge) that were over 300,000 square feet apiece. While the Cambridge store boasted amenities like a 500 foot long meat counter, 49 checkouts, an acre of produce and its own dedicated railway spur line, it was so dimly lit that it was possible shoppers wondered if someone would jump out of the shadows. Cambridge proved a last hurrah as the chain’s sales declined. Retail experts felt its practices were trapped in a 1970s time warp. Investments in store infrastructure weren’t made, especially as Stavro devoted more time to the joys and legal hassles of his majority stake in Maple Leaf Sports and Entertainment. Because checkouts weren’t equipped with scales, shoppers waited for staff in the produce section to weigh their purchases. Ordering from suppliers remained handwritten long after the competition went electronic (“That computer stuff is not for us,” Stavro once noted). Ads from the late 1990s suggested that practices like letting shoppers pick their own non-prepackaged produce was still a novelty. The stores aged badly, creating, according to retail consultant Richard Talbot, “a real down-market grubby feel.” At Dundas and Lansdowne, pools of water required regular dodging, while similar hazards at other stores led to at least two slip-and-fall lawsuits. Competing economy grocers with upgraded locations like No Frills and warehouse clubs like Costco provided brighter, cleaner shopping experiences. Source: the Toronto Star, August 26, 2000. 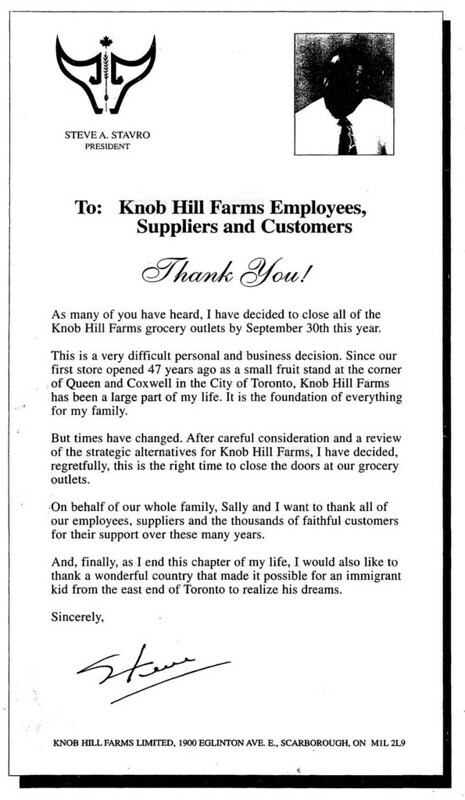 On August 25, 2000, the chain’s 800 employees were informed that Knob Hill Farms was closing. Over the next six months stores shut down individually, though the first proved controversial. Months earlier, Stavro secured a controversial 20-year lease extension for the Cherry Street terminal, promising to expand the store. The city had wanted the land for waterfront revitalization and its 2008 Olympic bid. When the store closed, speculation ran wild as to why Stavro wanted to hold onto the property. Legal tussles between Stavro and the city dragged on for several years, until the city declared the lease, which had been passed on to other interests, was valid. The site was eventually converted into a T&T supermarket. When the Weston Road store brought the Knob Hill Farms story to an end in February 2001, Stavro reflected that “there is a bit of sadness…but in life you have to face these things and move on.” While some locations sit abandoned or have been demolished, others have been converted into retailers ranging from other grocers to Home Depot. Perhaps the main lingering trace of the chain is the sturdy plastic baskets lying around laundry rooms and garages throughout the GTA etched with the store's steer-head-and-wheat logo. Additional material from the September 18, 1975, November 19, 1977, and April 25, 2006 editions of the Globe and Mail; the August 26, 2000 edition of the National Post; and the August 15, 1991, August 26, 2000, and February 11, 2001 editions of the Toronto Star. Stay tuned for the final installment of this series on April Fools' Day.